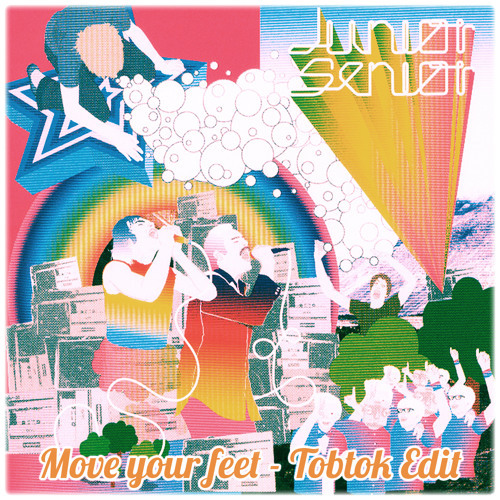 “Move Your Feet” is a song by Danish pop duo Junior Senior. The song, originally released in July 2002 in the duo’s native Denmark, was later released in 2003 worldwide and became Junior Senior’s biggest hit, reaching No. 3 in the United Kingdom and No. 20 in Australia. The song has been used in the promotional advertising for the Australian version of So You Think You Can Dance (along with the UK equivalent ‘Dance X’) and in television advertising for Google Chrome and the Mexican footwear company Coppel Canadá and in a 2003 VH1 promo. It made a brief appearance in movies such as Looney Tunes: Back in Action, How to Eat Fried Worms, White Chicks, and Forgetting Sarah Marshall. The song has also been featured on PBS Kids, and the TV series One Tree Hill, in the popular dancing games Dance Dance Revolution Extreme, Wii’s Just Dance 2 and PlayStation 3’s SingStar. It also featured in a 2013 commercial for Chromebook. A cover of the song appears in the 2016 animated film Trolls. The song was also used in the trailer for Knack II. The song appears on the album D-D-Don’t Don’t Stop the Beat along with a live recording.